JAPAN: Softbank Corporation, a Japanese telecommunications and internet giant, is to invest in the nation's first commercial offshore project. Softbank, headed by one of the Japan's richest entrepreneurs, Masayoshi Son, is already a major player in the Japanese solar market generating more than 65MW of power. The company is also constructing an onshore wind project in Hamada-city in Shimane prefecture, which will generate 48MW of power when completed. A Softbank spokesman confirmed it will add offshore wind to its power generation portfolio. On April 30, Japanese media reported SB Energy, a wholly-owned Softbank subsidiary will invest in a 90MW offshore project being developed by Wind Power Energy, a Kamisu, Ibaraki prefecture based company. The Nihon Keizai Shinbun, Japan's business broadsheet reported Softbank would install 18 turbines, each with a capacity of 5MW, generating a total of 90MW of power. The project will be located between 600 and 1,600 metres off the coast of Kamisu, and set to come online in 2017. Softbank did not deny the report. 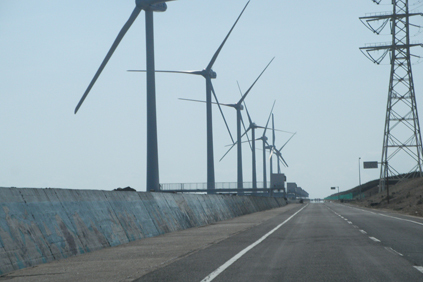 In wind power terms, Kamisu is best known as the hosting the near-shore wind farm that withstood the tsunami in 2011. "It is true that we will invest in offshore wind power, but we are still working on the details," a Softbank spokesman said. "We are trying to discover how far it is viable as a business." He also revealed that Softbank is conducting due diligence regarding the investment by its subsidiary, and that SB Energy would likely be the junior partner in any such venture.